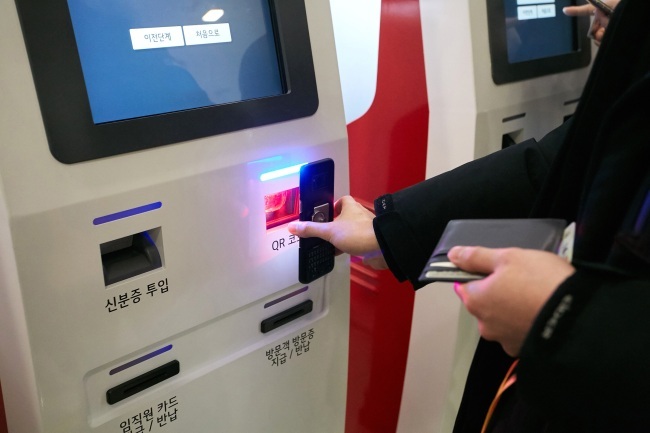 LG CNS, the information technology services unit of South Korea’s LG Group, launched a smart access card system on Tuesday to cater to the access control needs of large enterprises. The IT service provider introduced an automated access card-issue machine that will save time when checking in visitors, by digitalizing the verification and card issue process. Visitors usually have to visit the information desk, present an ID card, receive a temporary pass and attach stickers to their smartphone cameras for security. When there are multiple visitors with limited information desk staff, the process can take up to an hour. LG CNS’ card-issue machine greatly simplifies these steps. Visitors present their ID card and enter a phone number. By placing a QR code generated on a mobile app on the machine, the phone’s camera, mic, Bluetooth, and tethering functions are automatically turned off. The entire process takes just 25 seconds. The machine also automatically tracks the number of visitors by tracking the cards issued and returned, removing the need for human intervention. LG CNS expects this smart access card system to become useful at conglomerates as well as government bodies with a need for access control. On the day, the company also introduced an artificially intelligent security solution that authenticates and keeps track of company documents and their status. Using image matching technology, the solution can compare documents that were printed out, with those that were meant to be destroyed, to discern potential data leaks. The technology boasts 99 percent accuracy, the firm said.